So, you have just got your kindle or your thinking of getting one. Perhaps an upgrade is what your after or just wish to get a little more familiar with your shiny e reader. 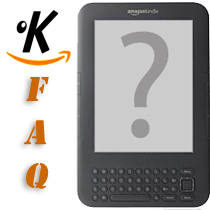 Below are 6 of the most popular questions answered about the Kindle and may help make understanding the device a little easier. Should I let my Kindle go into sleep mode or turn the device off by the power switch? If you leave your Kindle unattended for long enough it will go to sleep. When it is asleep it will not consume any power unless services like the wifi are left on. If you need the wifi on all the time it is best to turn the Kindle off when not in use. The kindle will still use the battery power to check the wifi signal. Should I leave the wifi on or off on my Kindle? Generally you can turn your wifi off whenever you don’t need to be downloading anything. There are situations where you might want to leave the wifi on overnight. If you subscribe to a newspaper or magazine that has daily downloads you could leave the wifi on and get the next fresh issue as soon as its published. How long should the batteries last before they need recharging? This varies from model to model with the Kindle Paperwhite or older models like the 3 and the touch lasting up to a month from a full charge. The Kindle Fire with its colour screen and internet access will be dependant on the amount of use. In general it is advisable to recharge your Kindle when the battery has about 25% of charge left. Leaving this any longer may cause some download and synchronizing problems. If this happens then recharge your Kindle and then try re syncing. Does the Kindle have a built in light or screen illumination? The Kindle Fire and the Kindle Paperwhite have a backlight or backlit screen the others do not. You can however buy from a range of Kindle clip on lights if night time reading is your thing? Will any books I buy from Amazon be in my Online Archive forever? Well . . . Amazon say “Yes”, but there have been occasions where this has gone wrong and in some cases Amazon have deleted books directly from the Owners Kindle. This is rare but owing to the ebooks DRM (Digital Right Management) books can be removed or controlled. A solution to this slight nag is quite simple. Just make sure you have copied your ebooks to your computer by syncing the Kindle to your library computer. Can I lend my ebooks to other people and borrow books from others? Originally the answer to this was a resounding “NO” but things are changing. You can also use a local library that has an ebook Kindle local library lending system. You can Join Amazon Prime, a paid for Amazon system that allows a free download of a book a month for a limited time. Amazon Prime also gives discounts on other items and priority delivery services. However at £50 this will probably only appeal to people who use Amazon a lot. You can lend books to others if the lending feature is turned on and the publisher of the book agrees. You can only lend the book once to one other person and the lending period is two weeks. During this time you cannot access the book your self.